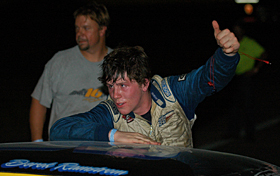 Wednesday, 10:27pm ET - Derek Ramstrom has won his first PASS North Super Late Model race. He held off Mike Rowe at the finish. The rest of the lead lap cars were Ben Rowe, Johnny Clark, Travis Benjamin, DJ Shaw, Cassius Clark, Donnie Whitten, Walt Hammond, Matt Frahm, Trevor Sanborn, Steve Berry and Steve Knowlton. Of course, we want to stress that this lineup is unofficial. Wednesday, 10:21pm ET - With seven laps to go, the caution is out again for a spin in turn two by Matt Frahm. When the caution came out, Derek Ramstrom had a healthy lead over Mike Rowe, Ben Rowe, Trevor Sanborn, Johnny Clark, Travis Benjamin, Cassius Clark, DJ Shaw, Donnie Whitten and Walt Hammond. Johnny Clark is complaining that there is oil all over the track. He's pretty wound up on his radio and someone must have been listened, because track workers are dumping a Gator-load of speedy dry in turn three right now. The restart could be a messy one. Wednesday, 10:16pm ET - Derek Ramstrom made a great restart, but he'll have to do it again to keep the lead because we're under caution at lap 182. The reason is that Harry Olsen ran into the wall at the pit entrance. Ramstrom currently leads Ben Rowe, Mike Rowe, Travis Benjamin, Trevor Sanborn, Johnny Clark, Cassius Clark, DJ Shaw, Walt Hammond, Donnie Whitten and Steve Knowlton. Matt Frahm and Steve Berry are the next two cars and the only other ones on the lead lap currently. Wednesday, 10:09pm ET - We're under caution at lap 174 and Derek Ramstrom is the new leader. How that happened was pretty crazy. Johnny Clark pulled away on the restart while the lapped cars of Donnie Whitten and Walt Hammond held up the rest of the top five. Ramstrom worked that lapped traffic masterfully to take second place. Then Clark had a flat tire and slowed. Ramstrom got by, while Rich Eaton slammed into Clark on the backstretch to bring out the caution. Hammond was ahead of Ramstrom when that happened and made up his lapped. Whitten got the lucky dog award and made up his lap too. Currently, Ramstrom leads Travis Benjamin, Ben Rowe, Mike Rowe, Cassius Clark, Trevor Sanborn, DJ Shaw and Steve Knowlton. Wednesday, 10:04pm ET - The top five battle turned ugly on lap 170. Ben Rowe was trying to hold off Derek Ramstrom for position when they came upon the lapped car of Harry Olsen. Kelly Moore and Trevor Sanborn were also in the mix. On the backstretch, Ramstrom got stuck behind Olsen. On the frontstretch, Olsen went around. Whether there was any contact or not isn't clear, but Olsen did spin right down in front of Moore....there was definately contact there. Olsen went over Moore's nose and ended up in the infield of turn one. Sanborn ended up being the innocent victim and he also ended up in the infield. So that reset the top 10 as Johnny Clark, Ben Rowe, Derek Ramstrom, Mike Rowe, Travis Benjamin, DJ Shaw, Cassius Clark, Steve Berry, Trevor Sanborn and Steve Knowlton. Wednesday, 9:55pm ET - Johnny Clark pulled out to a nice lead on the restart. Meanwhile, Scott Chubbuck and Jeremy Davis have both pitted under green and could be done for the night. Walt Hammond's #97 is smoking in the middle of each turn. Mike Rowe has just passed DJ Shaw for second. Ben Rowe is right behind that battle and Trevor Sanborn has now rejoined the top five. We're at lap 150. Wednesday, 9:55pm ET - On lap 129, there has been another big wreck. It seems like several cars got into oil on the backstretch and the cars of Rich Eaton, Matt Frahm, Scott Chubbuck, Steve Knowlton and Richie Dearborn all went around. One driver has complained that he smelled gear oil out there...so someone losing a rear end may have been the cause of that wreck. The top 10 right now are Johnny Clark, Ben Rowe, DJ Shaw, Kelly Moore, Mike Rowe, Travis Benjamin, Cassius Clark, Trevor Sanborn, Derek Ramstrom and Walt Hammond. Wednesday, 9:52pm ET - The caution is out for Sam Sessions, who spun a few times down the frontstretch before ending up parking in the turn one weeds. Johnny Clark is the class of the field at this point and currently leads Ben Rowe, DJ Shaw, Kelly Moore, MIke Rowe, Travis Benjamin, Cassius Clark, Matt Frahm, Rich Eaton and Scott Chubbuck. We're on lap 126. Wednesday, 9:45pm ET - One lap after the restart, the caution came out again. This time for a turn three tangle between Steve Knowlton, Sam Sessions and Richie Dearborn. Trevor Sanborn used this caution to make his pit stop and will restart in the rear with two new tires. Johnny Clark leads Ben Rowe, Cassius Clark, DJ Shaw and Travis Benjamin. Wednesday, 9:39pm ET - On lap 113, the caution is out for Walt Hammond facing the wrong way in turn four. Steve Berry and Jamie Swallow, Jr. were also involved in the incident somehow. Berry has pitted, but might receive a penalty because he came down pit road before it was open. Johnny Clark still leads Trevor Sanborn, Ben Rowe, Cassius Clark, DJ Shaw, Matt Frahm, Sam Sessions, Travis Benjamin Scott Chubbuck and Mike Rowe. Wednesday, 9:37pm ET - On the restart, Johnny Clark went by Trevor Sanborn on the outside to take the lead. Wednesday, 9:33pm ET - Rich Eaton and Adam Bates tangled while battling in the top 10 and wrecked in turn four. Jamie Swallow, Jr. also got caught in the mess. Eaton drove away, but the other two haven't. It looks like they'll need a few wreckers to clean that all up. We're under caution at lap 102. The top 10 currently are Trevor Sanborn, Johnny Clark, Cassius Clark, Ben Rowe, DJ Shaw, Sam Sessions, Matt Frahm, Scott Chubbuck, Walt Hammond and Travis Benjamin. Wednesday, 9:28pm ET - Richie Dearborn spun by himself in turn four and that has brought out another caution on lap 98. He might have had a little bit of help. Steve Berry has pitted and Trevor Sanborn has inherited the lead. The rest of the top 10 runners are Adam Bates, Rich Eaton, Derek Ramstrom, Johnny Clark, Ben Rowe, Cassius Clark, Sam Sessions, Matt Frahm and Jamie Swallow, Jr.
Wednesday, 9:25pm ET - On lap 93, Scott Chubbuck got into the rear of Walt Hammond. That caused Hammond to spin around in turn four. He was collected by Jeremy Davis, Donnie Whitten and DJ Shaw. All four cars have body damage and a few also have flat tires. They all drive away though. Kelly Moore and Travis Benjamin are among the cars who have pitted. Shaw's team is doing some quick bodywork with duct tape. Steve Berry leads Adam Bates and Trevor Sanborn. Scott Chubbuck has been sent to the rear for his role in the incident. Wednesday, 9:22pm ET - On the restart, Kelly Moore and Steve Berry bounced into each other in a bttle for the lead. Berry took over the top spot with Adam Bates and Trevor Sanborn in tow. Moore has fallen back to fifth behind Derek Ramstrom. We're on lap 84 currently. Meanwhile, out of the cars that pitted for new rubber, Johnny Clark has made the most progress. He is back to ninth and climbing through the field. Wednesday, 9:18pm ET - Add Sam Sessions to your list of lead lap cars. He just spent a little extra time in the pits, but drivers were told in their drivers' meeting that as long as you pit when the pits are open, you won't be able to lose any laps in the pit area under caution tonight. Wednesday, 9:15pm ET - The fourth caution is out now. Jimmy Chambers got turned out of turn four and took a head-first trip into the frontstretch wall. There is a large amount of speedy dry going down on the track, so this will likely be a long caution. Richie Dearborn still leads over Kelly Moore, Steve Berry, Adam Bates and Scott Chubbuck. Richie Dearborn just dove down pit road for a scheduled stop. He has been joined by Scott Chubuck, Johnny Clark, Ben Rowe, Mike Rowe and DJ Shaw. The new top 10 are Kelly Moore, Steve Berry, Adam Bates, Travis Benjamin, Trevor Sanborn, Derek Ramstrom, Walt Hammond, Rich Eaton, Bobby Tripp and Steve Knowlton. Dearborn was the first out of the pits and he'll line up 11th with Johnny Clark, Matt Frahm, Scott Chubbuck, DJ Shawe, Mike Rowe, Ben Rowe, Cassius Clark, Jamie Swallow, Jr. and Donnie Whitten. Those appear to be all of the lead lap cars. Steve Berry's team is discussing a panhard bar adjustment during their upcoming stop. He has told his team that he may look fast, but both he and leader Kelly Moore are running "on the ragged edge". Wednesday, 9:04pm ET - On the restart, Steve Berry used the outside lane to move into the lead. He stayed there for two laps before Dearborn got by again and reclaimed the top spot. Currently, they are back to single file with Kelly Moore, Adam Bates and Scott Chubbuck behind them. Wednesday, 9:01pm ET - On lap 43, the second caution has come out. This time, it was for a spin by Jeremy Davis who spun in turn four. Two laps later, the cars of Steve Knowlton, Matt Frahm and Jamie Swallow tangled in turn three to bring out the third caution. Right now, under caution, the top five are Richie Dearborn, Steve Berry, Kelly Moore, Travis Benjamin and Adam Bates. Dearborn has led every lap so far. Wednesday, 8:52pm ET - At lap 40, we've had our first caution period. Harry Olsen spun off turn one in a single car incident. Richie Dearborn currently leads Kelly Moore, Adam Bates, Steve Berry, Travis Benjamin, Trevor Sanborn, Scott Chubbuck, Ben Rowe, Mike Rowe and Johnny Clark. Cassius Clark has pitted for adjustments. He was running deep in the teens before this caution and told his team over the radio that the car was running like a "toilet". Wednesday, 8:43pm ET - Richie Dearborn rocketed into the lead early on and at lap five leads Kelly Moore, Adam Bates, Steve Berry and Scott Chubbuck. Wednesday, 8:05pm ET - Brian DeStefano won the Fast Eight feature race. Track owner Bobby McArthur dropped out on lap six. He was battling for the lead, but slide up the track in turn one and ended up just parking his car. A 25-lap Strictly Stock race and a Dwarf car feature are still on tap before the 200-lap PASS North Super Late Model race starts. We're thinking that the 8:15pm goal for a green flag in that big event might be a little bit optimistic at this point. Wednesday, 8:00pm ET - When the heat races for this event were held a few weeks back, Steve Knowlton tangled with Kyle Busch in their qualifier. Knowlton was penalized for the incident. Later that weekend, Busch also was involved in a confrontation during the NASCAR Sprint Cup Series race at New Hampshire Motor Speedway with Juan Pablo Montoya. 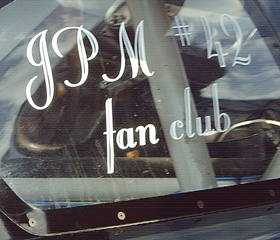 So it came as little surprise this week when Knowlton's #10 Super Late Model sported a "#42 JPM Fan Club" message on the quarter window of his racecar. That message was cause for a few chuckles in the pit area at All-Star Speedway. Wednesday, 7:40pm ET - We're getting closer to race time as a few of the local division races make it to the track. A short scuff session for the PASS North teams has taken place and this time both Richard Moody Racing cars - the #4 of Ben Rowe and the #44 of Trevor Sanborn took part in the session. Tonight's PASS race is 200 green flag laps and teams are allowed six tires for the race. They can change two tires in addition to the four that are on the car at the start of the feature. Wednesday, 7:15pm ET - The weekly series racing divisions that are here tonight (Fast Fours, Fast Eights, Strictly Stocks and Dwarf Cars) are on the track for their heat races. Track owner Bobby McArthur, an occasional PASS North driver himself, got behind the wheel of the #55 in the Fast Eight heat race and there was no love for the owner by his drivers - McArthur got boxed in and beat around by two different drivers before making it to turn two of the heat race. But he looked to have a grand old time on the track and finished fifth out of the five cars still running at the end of eight laps. Wednesday, 6:10pm ET - There is another two late additions to the lineup here. The #7 of Donnie Whitten is on track practicing right now along with a white and blue #00 Super Late Model of Ginny Quinones. Wednesday, 6:05pm ET - Apparantly, the PASS North Super Late Models have been given another practice session. They are currently on the track right now taking practice laps. Wednesday, 5:50pm ET - The first 15-minute practice session for the PASS North Super Late Models is complete. The schedule only calls for one small final practice session after this, which should take place after heat races for the local divisions around 8pm. However, there are two versions of the schedule floating around, so that could change. Derek Ramstrom went for a solo spin with his #35 in turn four during the first practice session. He did not hit anything. And you can add Jimmy Chambers to the roster for tonight. His #7 arrived late, but in time for practice. No Richard Moody Racing cars practiced as they were also a late arrival, but from the press box, we can see at least one of the yellow cars of the team being unloaded. Wednesday, 5:10pm ET - Welcome to All-Star Speedway (NH), which is the site of tonight's Wednesday night PASS North Super Late Model special. The race was orignally scheduled for the weekend of the New Hampshire Motor Speedway NASCAR Sprint Cup race in June, but got rained out after heat races were completed. With a full schedule of racing through the end of the year, track and series officials stuck this on the schedule as a Wednesday night show. Cup drivers Kyle Busch and Regan Smith were here in June, but have not returned for the make-up race. Their teams are not here either. 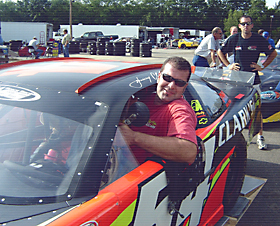 Busch had run hs own #51 car, whle Smth drove for Jay Cushman's #29 team. Cushman is here tonght as a spectator, but he reports that the #29 Ford is beng repaired after Ted Chrstopher ran it here two weeks ago during a regular Saturday night Pro Stock/Super Late Model show. Not all of the teams are here yet. The most notable team not yet in the pits is the #4/#44 Richard Moody Racing superteam of Ben Rowe and Trevor Sanborn, but we're sure they will roll in at any time now. 04 - Jamie Swallow, Jr.
Ginny Quinones' #00 in the pit area. 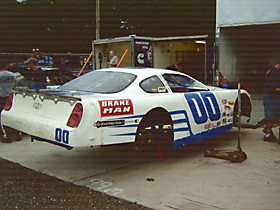 Steve Knowlton's #10 Super Late Model sported a message to Juan Pablo Montoya on his quarter window. They had something in common last month.